In this section you will find the names of Marines from 2/9 who are listed on "The Wall" I would like to thank Colonel Joe Long for his assistance in providing this information. 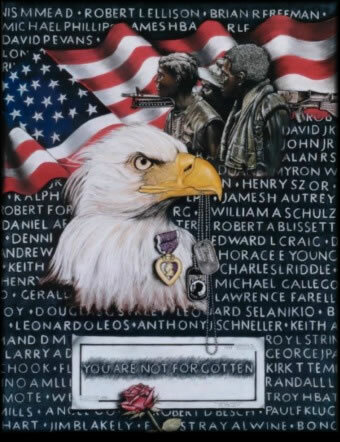 I would also like to thank Steve and Marnette Clemons for providing the middle names and the panel and line numbers that these men can be located on "The Wall"
And a thank you to Charles “Herc” Salerno for allowing The Network to use his patriotic artwork titled “Honoring & Remembering”. This work is “Hercs” tribute to his fallen comrades in the Vietnam conflict. The original hangs in the National Vietnam Veterans Art Museum in Chicago, IL. Charles served in the 2nd battalion 9th Marines in Vietnam with Fox Company in ’66-’67.